Fall brings with it many seasonal treats, like crisp apples, warm caramel, sweet spices, delectable pies and pumpkins, among others. 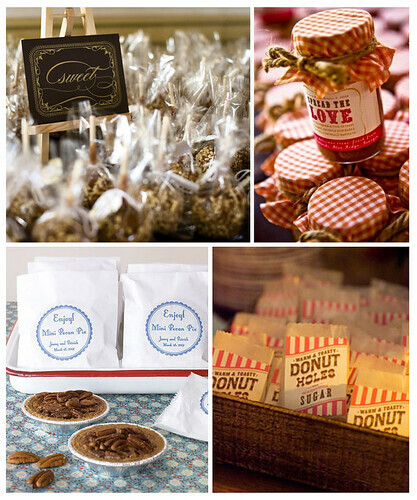 Edible favors are always gladly accepted, so consider individual caramel apples, small jars of pumpkin butter, mini pies, or tiny bags of cinnamon sugar donuts. As fall is filled with chilly breezes, opt for favors that give off a feeling of warmth. A basket of pretty pashmina shawls is the perfect choice – simply purchase pashminas in colors that compliment your wedding style, roll them up and tie with a string or ribbon and place them in a basket for guests to take throughout the night. 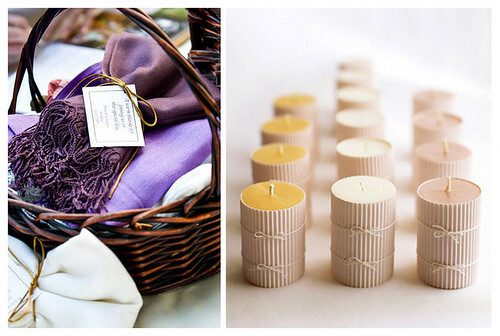 For another idea, place small beeswax candles out on a favor table for guests to take home with them. The candles featured below contain a surprise – rolled into the lining of the candle is a personal note from the bride and groom.